Adoptive transfer of DT-resistant CCR2+ cells reconstitutes the pancreatic CCR2+ myeloid pool. (A) FACS analysis of myeloid populations used for adoptive transfer, and time line of cell and DT injections. Adoptively transferred populations were GR1+ CD3–B220–CD11c–Ter119– cells isolated from BM of C57BL/6-Tg(CAG-EGFP)10sb/J or CCR2WT/RFP reporter mice, purified to >97% by negative selection, or CCR2-RFP+ cells FACS sorted from GR1+ cells based on RFP expression in the depicted gate. 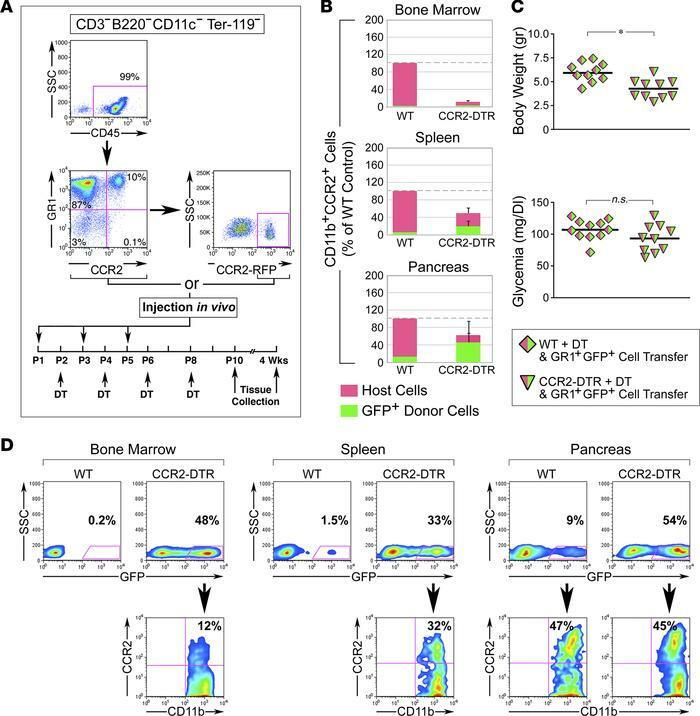 (B) Contingency plots showing the relative representation of host- and donor-derived CD11b+CCR2+ myeloid cells in BM, spleen, and pancreas after reconstitution of DT-treated WT and CCR2DTR/+ mice with DT-resistant GR1+GFP+ cells (mean ± SEM of n = 3–6 tissue samples per group and tissue type). (C) Body weight and basal glycemia in P10 WT and CCR2DTR/+ mice treated with DT and simultaneously rescued with DT-resistant GR1+GFP+ cells. *P < 0.05, unpaired t test. (D) Flow cytometry plots of BM and splenic and pancreatic CD11b+ myeloid cells from DT-treated CCR2DTR/+ WT mice (P10) reconstituted with DT-resistant GR1+GFP+ cells. Gating on GFP+ cells (bottom row) demonstrates a substantial fraction of CCR2+ cells of donor origin in the pancreas. Representative of n = 3 experiments.